I also made a slight tweak to the canopy on a couple tiles. I don't want to mention the things I don't like because that makes it harder to get some honest feedback, but I will say that I'm not satisfied with the background layer, as well as several other elements. 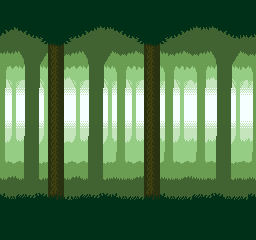 The only thing that really needs to still be "made" at this point are some tiles to round out the bottom of the trunks, and some grass or bush tiles to place sporadically on the ground. Please comment and offer suggestions. How should I tweak the color? Do the elements seem to have a cohesive style? Is there anything that seems to stick out or look off? My end goal is to use these tiles in a commercial project, so please don't try to spare my feelings. If this isn't good enough to be in something you'd pay for, let me know. I might be taking a break from this scene and working on some other environments for a while, so I can look at it with some "fresh eyes" before I finish it. But I promise I will be reading and considering all your comments. That looks a lot nicer, although I'd say a bit busy in the background. Have you tried black silhouette, or dark green silhouette? The one thing that has bugged me from the beginning is the continuous stone pattern. I'd bet more evidence of masonry would make it look more natural, or less natural and more man-made I should say.